Loyola University Chicago (often referred to as Loyola or LUC) is a private Catholic research university in Chicago, Illinois. Founded in 1870 by the Jesuits, today Loyola is one of the largest Catholic universities in the United States. Loyola's professional schools have educated generations of local business and civic leaders, and distinguished programs in medicine, nursing, and health sciences are anchored by the nationally recognized Loyola University Medical Center. Comprising eleven colleges and schools, Loyola offers over 80 undergraduate and 140 graduate/professional programs and enrolls approximately 16,000 students. Loyola has six campuses across the Chicago metropolitan area, as well as a campus in Rome and guest programs in Beijing and Ho Chi Minh City. The flagship Lake Shore Campus is on the shores of Lake Michigan in the Rogers Park and Edgewater neighborhoods of Chicago, eight miles north of the Loop. Loyola's athletic teams, nicknamed the Ramblers, compete in NCAA Division I as members of the Missouri Valley Conference. Loyola won the 1963 NCAA men's basketball championship, and remains the only school from Illinois to do so. The Ramblers are also two-time (2014, 2015) NCAA champions in men's volleyball. Among the more than 150,000 Loyola alumni, there are executives of major Chicago-based corporations such as McDonald's and Baxter International, as well as dozens of local and national political leaders including the current Illinois Attorney General and Speaker of the House. Loyola alumni have won Emmy, Grammy, Peabody, and Pulitzer awards, as well as Guggenheim and MacArthur fellowships. Loyola was established as St. Ignatius College on June 30, 1870, by Jesuit priest and educator Fr. Arnold Damen. At that time Chicago was a much smaller, but rapidly growing, city just shy of 300,000 people, and as a result the original campus was much closer to the city center along Roosevelt Road. In 1909 the school was renamed Loyola University, and in 1912 it began to move to the current Lake Shore Campus; today the original building is part of St. Ignatius College Prep, adjacent to the University of Illinois at Chicago. To meet the growing needs of Chicago, Loyola established professional schools in law (1908), medicine (1909), business (1922), and nursing (1935). The Chicago College of Dental Surgery became part of the university in 1923, and was closed 70 years later. A downtown campus was founded in 1914, and with it the School of Sociology. As the predecessor to the School of Social Work, it enrolled Loyola's first female students, though the school would not become fully coeducational until 1966. Loyola Academy, a college prep high school, occupied Dumbach Hall on the Lake Shore Campus until it was relocated to north suburban Wilmette in 1957. The current Water Tower Campus opened in 1949. In 1962, Loyola opened a campus in Rome near the site of the 1960 Summer Olympics. In 1969, Loyola established the School of Education and consolidated medical programs at the Loyola University Medical Center, a hospital and health care complex located in Maywood, an immediate suburb of Chicago. The university legally separated from the Jesuits in 1970, and today is under lay control and governed by a board of trustees. Loyola purchased neighboring Mundelein College in 1991. Major capital campaigns since the turn of the century have greatly enhanced Loyola's academic profile and campuses. In 2005 the Loyola University Museum of Art was established on the Water Tower Campus, and the Rome campus was renamed in honor of Director Emeritus John P. Felice. In 2009, the Cuneo Foundation presented the university with the Cuneo Mansion and Gardens, a 100-acre estate with an Italianate mansion and extensive collections of art and furnishings located in suburban Vernon Hills. The $50 million gift is the largest in Loyola history. In 2010, Loyola purchased the Resurrection Retreat Center in Woodstock, which became the school's fifth campus for retreat and ecological study. In 2012, Loyola alumnus Michael R. Quinlan donated $40 million to the business school, which was renamed in his honor. During this time over 200,000 square-feet of LEED-certified sustainable spaces have been built on the Lake Shore Campus alone, along with significant mixed-use developments on the Water Tower Campus. Today, Loyola ranks among the top 89 universities in the nation, and is in the midst of over $800 million in capital construction projects. In 2015, the university established Arrupe College, a uniquely structured two-year college designed to give low-income students access to a Loyola education. On May 23, 2016, Loyola named Jo Ann Rooney its 24th president. She is the first female president in the history of the university. The Madonna della Strada Chapel, a striking Art Deco masterpiece completed in 1939, is the center of Loyola's religious life. The Mundelein Center, a 200-foot tall Art Deco skyscraper completed in 1930, is the home of Loyola's fine and performing arts programs and a National Historical Landmark. The Joseph J. Gentile Arena, which holds 5,500 for basketball, volleyball, and campus events, was recently expanded to include the Norville Center, a student-athlete academic center and home of Rambler athletics. One of the largest events held annually in Gentile Arena is Colossus, which features a musical artist and comedian. Artists including Jason Derulo and John Mulaney have performed for Colossus. The Halas Recreation Center was remodeled and incorporated into the sprawling new Damen Student Center, the heart of campus social life. The E.M. Cudahy Memorial Library contains over 900,000 volumes and 3,600 periodical subscriptions, and in 2008 was expanded to include the Richard J. Klarchek Information Commons, an academic and social space with glass curtain walls that offer unparalleled views of the lake and campus. Science education and research takes place in the Quinlan Life Sciences building and the Institute of Environmental Sustainability, a multipurpose complex that includes academic space, a residence hall, a greenhouse, and the largest geothermal energy facility in Chicago. The Lake Shore Campus is connected to the famous Chicago 'L' via the Loyola station on the CTA Red Line. Southbound trains pass through neighborhoods like Lake View and Lincoln Park on the way to the Loop and South Side, while northbound trains connect to Evanston, the home of Northwestern University. Loyola is committed to creating environmentally sustainable campuses, and various efforts have reduced university energy use by 33% since 1998. Loyola has three LEED Silver certified buildings and four LEED Gold certified buildings, with all future construction to be LEED certified as well. Loyola has more green roofs than any college in the Midwest, which includes both new and renovated buildings. These efforts have not gone unnoticed: in 2014, Loyola placed 4th nationally (and 1st in Illinois) in the Sierra Club's ranking of America's Greenest Colleges. 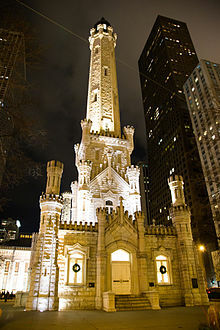 The Water Tower Campus opened in 1949 along a stretch of Michigan Avenue today known as the Magnificent Mile, and is named after the Chicago Water Tower, a city landmark that survived the Great Chicago Fire of 1871. It is the home of the Quinlan School of Business, the School of Law, the School of Education, the School of Continuing and Professional Studies, the School of Social Work, the School of Communication, the Institute of Pastoral Studies, and Arrupe College, as well as a selection of classes from programs based elsewhere. Dominated by mixed-use skyscrapers, campus buildings include the Corboy Law Center, Terry Student Center, Baumhart Hall, and landmark Lewis Towers, built in 1945 as the Illinois Catholic Women's Club and today home of the Office of the President and the Loyola University Museum of Art. Recent construction includes The Clare, a 587-foot tower that serves as both a retirement community and the home of the College of Communication, and the LEED certified John and Kathy Schreiber Center, which opened in 2015 as the new home of the Quinlan School of Business. The campus puts students at the heart of Chicago's business and cultural life: it is steps from the offices of major corporations, Chicago's premiere retail and tourist district, as well as institutions like the Museum of Contemporary Art and the Newberry Library. Holy Name Cathedral, the seat of the Archdiocese of Chicago, is directly adjacent to the south. The Water Tower Campus is also connected to the 'L' via the Chicago station on the CTA Red Line. Students can conveniently travel between Water Tower Campus and Lakeshore Campus on a school-sponsored shuttle during the week. Founded in 1969 along with the Loyola University Medical Center, the Health Sciences Campus is the home of the Stritch School of Medicine, the Marcella Niehoff School of Nursing, and several programs that are part of the School of Continuing and Professional Studies. It is in Maywood, an immediate western suburb of Chicago, approximately eleven miles from the Loop. A leading academic center for teaching and research, Loyola University Medical Center comprises the main hospital, Loyola Outpatient Center, Ronald McDonald Children's Hospital, Cardinal Bernardin Cancer Center, and several medical office and laboratory buildings. In 2011, the medical center was sold to Trinity Health, while Loyola continues to own and operate the academic buildings and select research facilities on campus. In 2017, Loyola expanded its accelerated nursing program to an online-based format with lab in Downer's Grove. Loyola's permanent campus in Rome opened in 1962 at Casa Italiana Viaggi Internazionali Studenti (C.I.V.I.S. ), a dormitory originally built to host athletes during the 1960 Summer Olympics. In 1978, the campus moved to its current location on Monte Mario approximately two miles northwest of the Vatican City. The campus is the home of the oldest American university program in Italy, and hosts students from both Loyola and other universities seeking to study abroad. In 2005, the campus was renamed in honor of founder and Director Emeritus John P. Felice. In 2010, Loyola founded the Retreat and Ecology Campus on the former site of the Resurrection Retreat Center in Woodstock, Illinois an outer suburb approximately fifty miles northwest of Chicago. The campus houses the university's campus ministry programs, and offers a unique learning opportunity for students and faculty interested in the sciences. The property contains 20 acres (8 ha) of natural habitat that includes ponds, streams, woods, and prairieland. Loyola also owns and operates the Cuneo Mansion and Gardens in suburban Vernon Hills, approximately thirty miles north of Chicago. The mansion and grounds were donated to the university in 2009 by the John and Herta Cuneo Foundation. The estate operates as a museum and hosts special events and a growing number of academic programs in business, education and law. For the 2016–2017 academic year, undergraduate tuition for new full-time students was $41,720 per year, not including room, board and fees including the CTA student transit 'U-Pass', Student Activity Fee, Technology Fee and mandatory health insurance. Graduate school tuition varies depending on the school. Loyola University Chicago is ranked 89th among National Universities according to the latest (2019) U.S. News & World Report college rankings. U.S. News commonly places Loyola among their fifty "Best Value" colleges as well. In 2011 USA Today ranked Loyola 6th among "colleges most committed to community service." Washington Monthly ranked Loyola 21st in the nation for hours of community service. Loyola's Graduate School of Business has been ranked #1 in Ethics nationwide by BusinessWeek. In addition, Loyola's History Department ranked sixth in the nation in 2006 on the Faculty Scholarly Productivity Index, a respected ranking system of graduate faculty quality. In 2010, the History Department also ranked in the top tier in the 2010 National Research Council's evaluation of the nation's graduate programs. A statue of Ignatius of Loyola was dedicated in 2000 and was relocated to the lobby of the Klarchek Information Commons. Religious education is still one of Loyola's hallmarks as it is home to Saint Joseph College Seminary as well as the Jesuit First Studies program. Loyola's First Studies Program is one of three in the country, with Fordham University and Saint Louis University housing the other two. During this three-year period, Jesuit Scholastics and Brothers generally study philosophy and some theology. First Studies is one part of an eleven-year formation process toward the Jesuit priesthood. This program is administered by the Chicago Province Society of Jesus. Saint Joseph College Seminary serves the Roman Catholic Archdiocese of Chicago and provides vocational training to candidates of diocesan priesthood. Loyola University also provides rigorous religious education for those seeking careers in lay ministry with the Loyola University Institute of Pastoral Studies as well as degree opportunities in interdisciplinary Catholic studies. Loyola's Department of Theology also offers undergraduate and graduate courses in the study of systematic theology, ethics, and Biblical studies, offering a diverse set of classes that are not limited to religious studies in a Catholic context. Most of the residence halls and apartments managed by Loyola's Department of Residence Life are in the Rogers Park and Edgewater neighborhoods surrounding the Lake Shore Campus. One, Baumhart Hall, is at the Water Tower Campus on the Magnificent Mile in Chicago. Most of Loyola's residence halls are named after other Jesuit colleges and universities. First-year students may live in one of the following residences on the Lake Shore campus: Campion Hall, de Nobili Hall, Mertz Hall, Regis Hall, San Francisco Hall, and the Simpson Living Learning Center (Simpson Hall). Simpson, Mertz, and de Nobili Halls are conveniently located above dining halls that serve these buildings and the halls surrounding them. Residence halls on the north side of campus are served by a dining hall and food court in the Damen Student Center. First- and second-year students are required to live in on-campus housing. Upperclass students are permitted to choose from fourteen residences at the Lake Shore campus: Bellarmine, Canisius, Fairfield, Fordham, Georgetown, LeMoyne, Marquette, Marquette South, Messina, Regis, Santa Clara, Seattle, Spring Hill and Xavier Halls. Santa Clara Hall is on Loyola Avenue right on Lake Michigan. Upperclassmen can also choose to live in Baumhart Hall, located at 26 E. Pearson, just a block from the Magnificent Mile in downtown Chicago. It is a 25-floor apartment-style residence for upperclassmen and graduate students at Loyola University. Students living in Baumhart and taking classes on the Water Tower Campus have access to two dining facilities: Nina's Cafe (in the Corboy Law Center) and LU's Old-Fashioned Deli and Pub (in the Terry Student Center). Loyola University Chicago is home to several Greek letter organizations. Among them are traditional social fraternities and sororities, professional co-ed fraternities, and cultural interest fraternities and sororities. Inter-Fraternity Council chapters include Beta Theta Pi, Tau Kappa Epsilon, Sigma Chi, Delta Sigma Phi, and Pi Kappa Phi. Panhellenic Council chapters include Alpha Chi Omega, Alpha Sigma Alpha, Phi Sigma Sigma, Kappa Kappa Gamma, Chi Omega, Alpha Delta Pi, and Kappa Delta. Professional co-ed fraternities include Delta Sigma Pi, Phi Delta Epsilon, as well as service fraternity Alpha Phi Omega. Cultural interest fraternities include the National Association of Latino Fraternal Organizations (NALFO) co-ed fraternity Alpha Psi Lambda. Loyola is also home to the Latino fraternity Lambda Upsilon Lambda fraternity, and the African-American fraternities Alpha Phi Alpha, Kappa Alpha Psi, and Phi Beta Sigma. Cultural interest sororities include Gamma Phi Omega, Sigma Lambda Gamma, Lambda Theta Alpha, Delta Phi Lambda, Delta Sigma Theta and Alpha Kappa Alpha. Loyola University owned and operated a low-power, carrier current radio station, WLUC-AM, in the 1960s. Students broadcast an eclectic music format on 600 kHz to Lake Shore Campus buildings and the surrounding Rogers Park neighborhood. The station had a well-equipped studio in a University-owned Student Life house on Loyola Avenue. The structure was demolished to make way for the Crown Center for the Humanities. WLUC-AM was replaced by an on-air FM station, WLUW, in the 1970s. Loyola is home to 11 varsity teams, most of which compete in NCAA Division I. The teams include men and women's basketball, cross country, men and women's golf, men and women's soccer, softball, track, and men and women's volleyball. The nickname "Ramblers" was first applied to Loyola's football team in 1926 because they frequently traveled throughout the United States. LU Wolf is the mascot for the University. He was inspired by the coat-of-arms of St. Ignatius of Loyola, from whom Loyola derives its name, which depicts two wolves standing over a kettle. Taken from the heraldic crest carved in the lintel on St. Ignatius' family home in Azpeitia, Spain, the wolves and cauldron refer to the prosperity and generosity of the Loyola family, who, after feeding family, retainers and soldiers, had enough food to feed even the wild animals. Loyola's men's basketball team, the Ramblers, won the 1963 national championship. Loyola is the only Division I NCAA school in Illinois to have won a national title in men's basketball. They also hold the all-time highest win percentage of any team to ever compete in the NCAA tournament. Loyola sits slightly ahead of Duke University. The Loyola Ramblers men's volleyball team won back-to-back NCAA championships in 2014 and 2015. In 2018, Loyola's men's basketball team won the Missouri Valley Conference tournament championship to qualify for the 2018 NCAA Division I Men's Basketball Tournament for the first time since 1985. The 11-seed Ramblers recorded four straight upset victories against the Miami Hurricanes, Tennessee Volunteers, Nevada Wolf Pack, and Kansas State Wildcats to advance to the Final Four. However, the Michigan Wolverines defeated Loyola in the Final Four. The publicity surrounding Loyola's tournament run generated an estimated $300 million in publicity for the school. In October 2018, the Loyola Ramblers Women's Soccer team won the Missouri Valley Conference regular season title with 6-1 win over Evansville. The win gave the Ramblers their first Missouri Valley Conference regular season title in program history. ^ "University Facing Potential $4 Million Budget Deficit in 3 Years if Costs Not Cut". Loyola Phoenix. ^ "Color Palette: University Marketing and Communication: Loyola University Chicago". Retrieved October 22, 2017. ^ "Loyola University Medical Center in Maywood, IL | US News Best Hospitals". health.usnews.com. Retrieved February 3, 2016. ^ "LUC State of the University Fall 2015". Archived from the original (PDF) on October 9, 2015. Retrieved February 28, 2013. ^ "Loyola University Chicago Official Athletic Site". www.loyolaramblers.com. Archived from the original on February 13, 2016. Retrieved February 3, 2016. ^ "NC Men's Volleyball". NCAA.com. Retrieved February 3, 2016. ^ Young, Kathy. "Research Guides: Archives and Special Collections: History of Loyola University Chicago". libguides.luc.edu. Retrieved February 3, 2016. ^ "The miracle along the lake". tribunedigital-chicagotribune. Retrieved February 3, 2016. ^ a b "How cheap money is helping Loyola expand". Crain's Chicago Business. Retrieved February 3, 2016. ^ "About Us: Loyola University Chicago". Loyola University Chicago – Cuneo Mansion & Gardens. Retrieved February 4, 2016. ^ "Loyola University Chicago | Loyola Chicago | Best College | US News". colleges.usnews.rankingsandreviews.com. Retrieved February 3, 2016. ^ "A debt-free college for students who struggle most". CNN. Retrieved October 11, 2016. ^ "Loyola University Chicago | Lake Shore Campus Lake Shore Campus". www.luc.edu. Retrieved February 4, 2016. ^ "AssetDetail". focus.nps.gov. Retrieved February 4, 2016. ^ "Institute of Environmental Sustainability About Us: Loyola University Chicago". Loyola University Chicago – Institute of Environmental Sustainability. Retrieved February 4, 2016. ^ "What Loyola is Doing What Loyola is Doing: Loyola University Chicago". Loyola University Chicago – Institute of Environmental Sustainability. Retrieved February 4, 2016. ^ "America's Greenest Colleges: The Top 10". Sierra Club. Retrieved February 4, 2016. ^ "Namesakes of campus buildings highlight Loyola's long history". Loyola Phoenix. Retrieved February 4, 2016. ^ "The John and Kathy Schreiber Center: Loyola University Chicago". Loyola University Chicago – Quinlan School of Business. Retrieved February 4, 2016. ^ "Loyola selling hospitals to Trinity Health". tribunedigital-chicagotribune. Retrieved February 4, 2016. ^ "Loyola University Chicago Accelerated Bachelor of Science in Nursing". Loyola ABSN. Retrieved August 18, 2017. ^ "Loyola University Chicago | Rome Center Rome Center". www.luc.edu. Retrieved February 4, 2016. ^ "John Felice 1923–2008: Loyola University Chicago". Loyola University Chicago – John Felice Rome Center. Retrieved February 4, 2016. ^ "Loyola University Chicago | Retreat and Ecology Campus Retreat and Ecology Campus". www.luc.edu. Retrieved February 4, 2016. ^ "Our 2013 Freshman Class". Loyola University Chicago. Retrieved August 10, 2014. ^ "Undergraduate Schools". Loyola University Chicago – Office of the Bursar. Retrieved May 5, 2015. ^ USA Today. Accessed 9 May 2016. ^ "Loyola University Chicago Ranked #1 in Ethics by Businessweek". JoePRGuy. Retrieved May 5, 2015. ^ "The Chronicle: Faculty Scholarly Productivity Index". Retrieved May 5, 2015. ^ "Sorority & Fraternity Life". www.luc.edu, the Loyola University Chicago Website. Retrieved September 16, 2015. ^ a b c "About SFL". www.luc.edu, the Loyola University Chicago Website. Retrieved September 16, 2015. ^ 1970 TO 1979. www.lib.luc.edu. Retrieved September 16, 2015. ^ Ramin, Nathan (2005). College Prowler: Loyola University Chicago Off the Record. College Prowler. p. 6. ISBN 978-1-59658-077-0. ^ McGrath, Dan (March 18, 2010). "Forget Illinois Shutout; Relive Tourney's Past". NY Times. Retrieved April 2, 2010. ^ "Loyola Chicago tops Duke for all-time best NCAA tournament win percentage". SBNation. SBNation. March 24, 2018. Retrieved April 1, 2018. ^ "Loyola wins men's volleyball title". ESPN. Associated Press. May 4, 2014. Retrieved August 29, 2014. ^ "Loyola-Chicago takes men's volleyball title". ESPN. Associated Press. May 10, 2015. Retrieved May 10, 2015. ^ Ryan, Shannon (March 4, 2018). "Loyola earns 1st NCAA tournament bid since 1985: 'It means a lot for the city of Chicago'". Chicago Tribune. Retrieved April 1, 2018. ^ Drape, Joe (March 22, 2018). "Loyola-Chicago Holds Off Nevada for a Third Straight Upset". The New York Times. Retrieved April 1, 2018. ^ Culpepper, Chuck (March 31, 2018). "Loyola Chicago almost pulled off another miracle before falling to Michigan in Final Four". The Washington Post. Retrieved April 1, 2018. ^ Redman, Henry (May 8, 2018). "Loyola's March Madness Publicity Worth More Than $300 Million". Retrieved May 9, 2018. ^ "Loyola Clinches MVC Title With 6-1 Win Over Evansville". Loyola University Chicago. October 25, 2018. Retrieved October 30, 2018. Wikimedia Commons has media related to Loyola University Chicago.